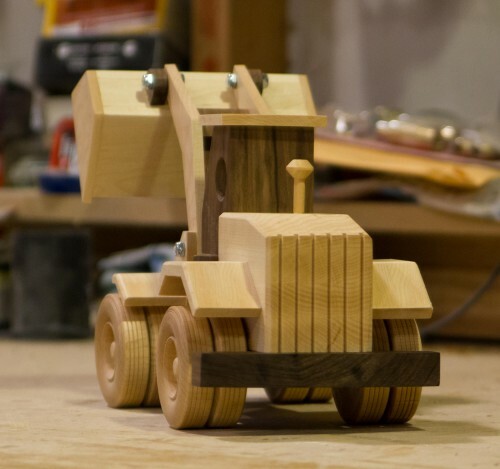 For the past years, every few issues of Wood Magazine have had plans for a construction toy. 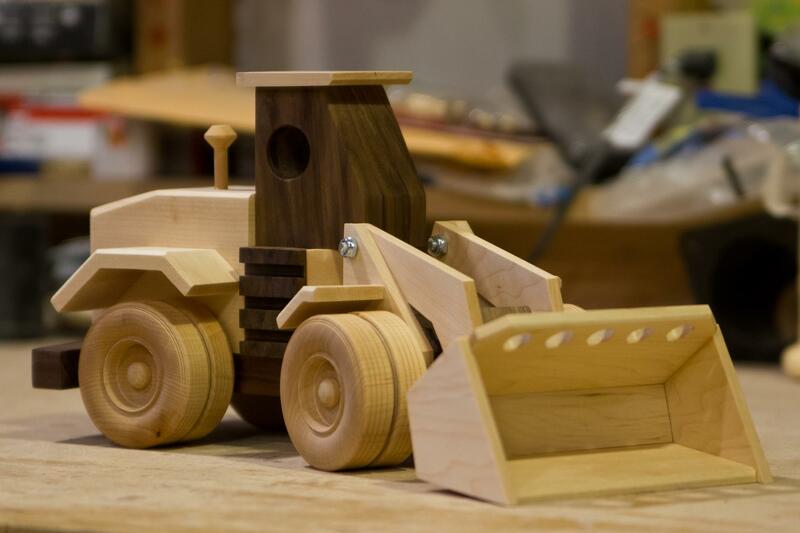 I recently purchased the plans for the End Loader and completed it. It was another big learning experience for me. Aside from the quick planes I did recently, this is the first toy that I’ve built. The biggest thing I learned is that precision matters. You can’t be too precise. I made a large number of these pieces twice just to get them perfect. I also spent a lot of time sanding to try and get it as clean and smooth as possible. Because it’s so small, people look at it very closely and even small flaws will stand out. Along with the plans, I also purchased the kit that contains wheels, smokestack and the hardware needed to complete the project. 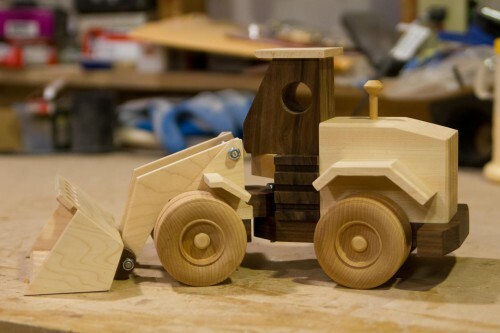 I don’t have great equipment for making those circular pieces so buying the kit let me focus on the rest of the loader. It took me about two weeks to complete and I’m thrilled with how it came out! One of the hardest parts was getting it all sprayed with lacquer. Lacquer is supposed to be sprayed above 65 degrees or in low humidity. I couldn’t spray it in my garage since the fumes are so intense and they can actually ignite from the pilot light in the furnace. I set up a pop up tent on the back patio, hung tarps from three sides and hung a space heater from the top, pointed down at the table. I also brought all the pieces and spray inside to let it warm up to room temperature. That setup might have been overkill, but I didn’t want to screw this up after all the time I put into it. I’m very happy with how this turned out. It will end up being Elijah’s Christmas gift. Last year I built him the table and this year he gets a toy. I think it would be fun to build something for him each year but we’ll see how that holds up. The next project or two will be quicker and easier but I think I might do one or two more of these toys. I have plenty of walnut and maple leftover from this project.